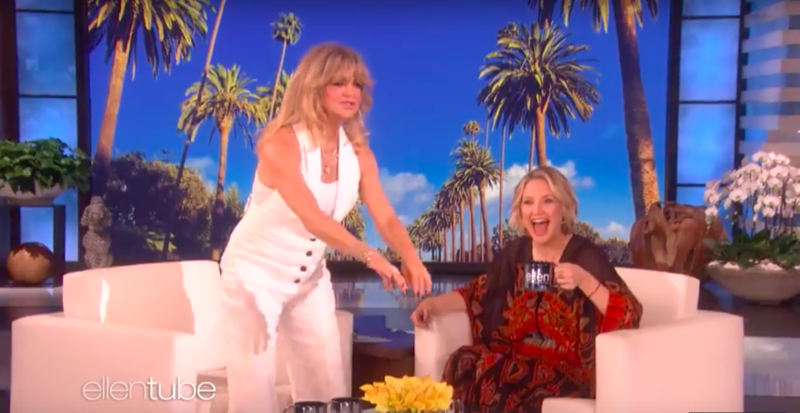 Your fave mother-daughter duo—Kate Hudson and Goldie Hawn—guest-hosted The Ellen Show on Thursday, January 17th, and proved that they need a family podcast asap. Hudson gave birth to her daughter Rani Rose back in October 2018 and on Ellen she let the world know that her mom was a little extra in the delivery room. “As you might know, we had my daughter,” Hudson said with a laugh, “which is kind of how it goes down in the birthing room, anyway. Hawn admitted that she was a little too involved when her daughter gave birth to son Bing in 2011, so she tried to scale it back this time. "First of all, I had to ask your permission," Hawn told the audience, "because the last time it happened, I had too many Doritos in front of you, brought you a lotus, asked you to smell it—which is the worst thing you can do to a pregnant person—and then you asked me to put down my pizza. Then when I had whatever, you leaned up and went, 'Mom, shut up!' in one of your major [contractions]. So, I was careful, and I said, 'Would it be okay? Do you want me in the room?' So, I did ask permission. See, I'm a really fair mom, aren't I? It's like, 'Honey, do you still want me?'" "[The doctor] was sort of like this, leaning down, doing the thing…and I'm trying to get in on him to try to look over his shoulder," Hawn said. "Now I see the head and I'm going, 'Oh! There's the head!' Then it went back, and he said, 'Goldie, if you get any closer, you're going to fall in!'" “The doctor was amazing. But mom, once again—she was right in there,” Hudson joked. You can watch the duos entire segment on YouTube.